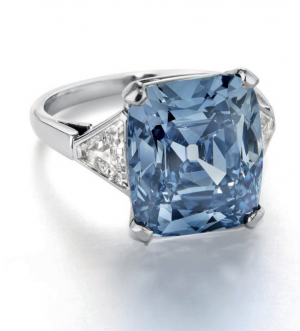 On December 5, 2018, Christie’s will be closing its auction season for the year with a Fancy Vivid Blue Diamond by Bulgari. It is an 8.08 carat, fancy Vivid Blue diamond with a VS2 clarity and Type IIb. 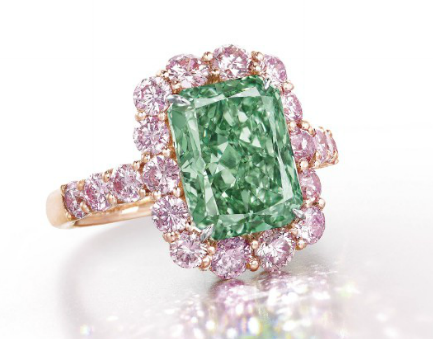 Christie’s will be showcasing many various Fancy Color Diamonds in its last auction for the year, closing one of the most volatile years for Fancy Color Diamonds. I will be doing a special summary report on the sector after the auction season ends by mid-December. 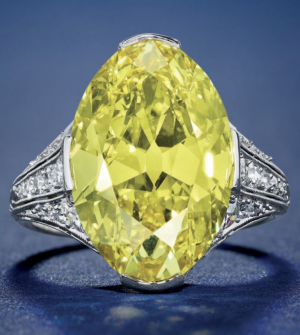 An 8.09 carat, Fancy Vivid Yellow, Oval shape with a VVS2 clarity (potentially Internally Flawless), is being offered at a valuation between $900k to $1.2 million or $111k to $148k per carat. This is an exceptional value range, which makes this diamond unique. There are Fancy Vivid Yellow which can be acquired for about half the price, but it means that their color will be less strong, and clarity is also inferior. An exceptional large Fancy vivid Green will be offered. At 3.01 carat, this is the second largest Fancy Vivid Green ever to be offered at auction; The largest being the 5.03 carat Aurora Green sold in Hong Kong in 2016. The sad part of this diamond is its clarity with the obvious inclusion seen on the crown of the diamond. That is why the diamond has half certificate, which usually means that the clarity is an I clarity. It is also reflected in the valuation given by the auction house. It is offered between $300k to $500k in total or $100k to $166k per carat. 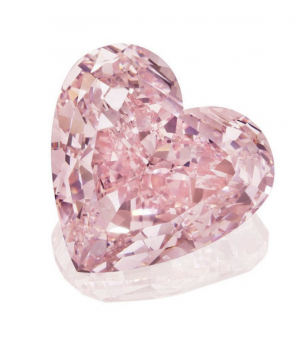 An exceptional 15.56 carat, Fancy Intense Pink, heart shape, with VS1 and Type IIa certification is being offered as well. This is the second item of value this evening after the 8.08 carat, Fancy vivid Blue Diamond. 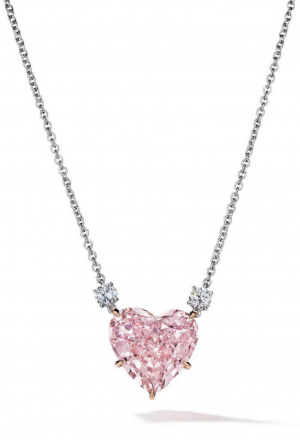 It is currently valued between $9.5 million to $12 million or $610k to $771k per carat. We definitely won’t see a new record broken with this diamond, but it is definitely a unique piece due to its perfect shape. There is another exceptional piece being offered this auction and that is due to its provenance. It is the “Foxfire Diamonds”. Coming in at 37.87 and 36.80 carats, both having been graded the color U to V and both having a VS1 clarity, they were both produced from the same rough that is also the largest ever mined in Canada; The Diavik mine. The rough was 187.66 carats. The four diamonds (including the two smaller ones on top at 1.53 and 1.51 carats) were polished from that same rough. 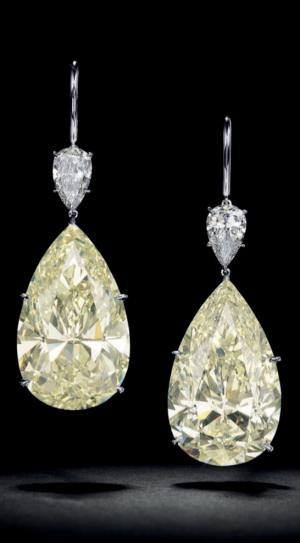 The pair of earrings are being valued at between $1 million to $3 million. The winning bidder will also enjoy a trip for two from anywhere in the USA or Canada to visit the mine, first class. The average per carat value based o the 2 larger diamonds is $13.4k to $40.2k per carat. The valuation strictly takes into account the unique provenance and that is the reason this pair of earrings are for a collector only (at this time). There are many other great Fancy Color Diamonds that will be offered during this auction, none is really considered an investment at this point in time. 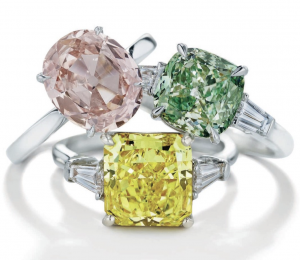 The only way any of these will start to be considered as an investment would be when demand will be at least 3-4 times supply and all Fancy Color Diamonds will be then considered an investment.